In ancient times, India has always been a great attraction for the world for her educational advancements. Bihar, in particular, with institutions like Nalanda and Vikramshila Unversity had played a pivotal role in attaining India her status of “Vishwaguru” in ancient times. Scholars from across the world use to flock to ancient Bihar for enlightenment of knowledge. But by the days gone by things deteriorated very fast. From people coming to this part of the world for seeking knowledge and wisdom to mass immigration of youths in search of education and employment, it was complete reversal of the situation. This situation always uses to bother the Chairman of Deo Mangal Memorial Trust, Shri Gopal Narayan Singh and he decided to challenge the status quo. He recognized that the problem was not the “unemployment”, but the “employability”. Our current educational infrastructures and resources were not adequate to cater to the needs of rising youth population. But it was a huge mountain to climb. A trust in the memory of parents of Chairman Shri Gopal Narayan Singh was formed in the name of Deo Mangal Memorial Trust. Rest as they say is history………..
First in the list of Trust achievements was a Medical College. Narayan Medical College & Hospital got permission from Medical Council of India in the year 2008. Next in the list was a Nursing College. 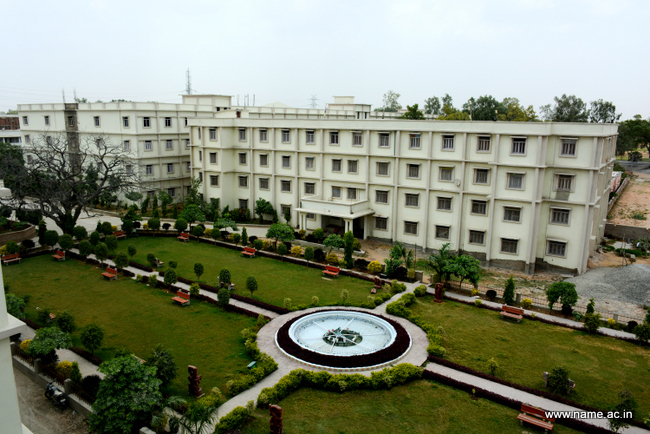 Narayan Nursing College was permitted by Indian Nursing Council in the year 2012. In the year 2016 Ministry of Health & Family Welfare gave permission to the Trust to start a paramedical institute, thus Narayan Paramedical Institute & Allied Sciences came into existence. In course of time, lack of quality mangers caught the attention of the Chairman as this region did not had any quality institution which could nurture the managerial talents of youths. They have to migrate to far places to get management education which was very financially burdensome for the family which primarily have an agrarian background. Situation for the girl students was even worse, as parent were very reluctant to let their girl child move out alone because of their safety concerns. It was, therefore decided to start a management college under the Trust. Putting great efforts Trust managed to get AICTE approval for starting a MBA course under the banner of NARAYAN ACADEMY OF MANAGERIAL EXCELLENCE (NAME) in year 2016 itself. A team of professionals has been engaged to start with new zeal and vigour in the field of management education. Narayan Academy of Managerial Excellence will certainly grow from strength to strength because the whole system of learning is based on faculty interaction, project based and involvement of corporate professionals with specific training modules for making students industry ready and highly employable. Keeping in mind, the core strength of the region and to ignite the culture of entrepreneurship Narayan Academy of Managerial Excellence (NAME) has decided to start a new program in Agri-business Management/Entrepreneurship which will specifically work for creating new generation agri-managers and entrepreneurs. College will also be offering courses in Human Resource Development and Sales & Marketing with prime view of creating new breed of professionals and entrepreneurs. With well drafted program and focused pedagogy the institute is dedicated for social cause. The upliftment of the youth of the area by enabling them fight the rampant unemployment is the prime motto of the institution and that too at a very affordable cost.